In your kitchen you start a three-minute egg timer and a 60-minute hourglass simultaneously and then leave. You return a short while later to find the hourglass fully discharged but not the egg timer! Something must be wrong with at least one of the two timers. The RATE project1 has discovered several striking examples of such contradictions in radioactive dating methods. In the Thousands . . . Not Billions seminars2 publicizing the remarkable RATE results, I have used a picture of two hourglasses to illustrate one pair of contradictory clocks. They use uranium, lead, and helium changing within a common mineral. I'd like to take this opportunity to explain the hourglass illustration more fully, because it clarifies some very encouraging scientific evidence that supports the Biblical timescale of Earth history -- six thousand years, not billions of years. To understand the two hourglasses, you need to know what goes on in tiny radioactive zircon crystals, common in granitic rock. As a zircon crystal begins to form in cooling magma (molten rock), it absorbs uranium atoms from the magma. It rejects atoms of lead.3 After a zircon is fully formed and the magma cools some more, a crystal of black mica called biotite forms around it. Other minerals, such as quartz and feldspar, crystallize around the biotite to complete the rock. The nuclei of the uranium atoms (embedded throughout the zircon) decay through a series of intermediate elements to eventually become nuclei of lead. Many of the intermediate nuclei emit alpha particles, which are nuclei of helium atoms. For the zircon size we are considering, many of the fast-moving alpha particles slow to a stop within the zircon. Then they gather two electrons apiece from the surrounding crystal and become helium atoms. Thus a uranium 238 atom produces eight helium atoms as it becomes a lead 206 atom. Helium atoms are lightweight, fast-moving, and do not stick chemically to other atoms. They wriggle between the atoms of a material and spread themselves as far apart as possible. This process of diffusion (spreading), theoretically well-understood for over a century, makes helium leak rapidly out of most materials. The conventional way to date zircons uses the nuclear decay of uranium to lead. Because the zircons have almost zero lead to begin with, essentially all the lead 206 atoms in a zircon today must have come from decay of uranium 238. Assuming the laboratory-measured decay rate remained the same throughout time, geoscientists can then calculate how long the decay would have to have been occurring to account for the present amounts of uranium and lead in the crystal. For the zircons we studied (from several miles underground), that time was 1.5 billion (± 20 million) years. An hourglass illustrates this dating method. The red sand in the top represents uranium 238 atoms in a zircon. From our knowledge that zircons have no lead initially, we know that at the start all the sand was in the top of the hourglass. The green sand in the bottom represents lead 206 in the zircon. Red sand falling through the neck changes color to green, representing the nuclear transformation of uranium to lead. The neck of the hourglass controls the rate. If the neck has never changed size, then the rate at which sand presently falls, combined with the amounts in the top and the bottom, would tell us how long the process has been going on. A report that some zircons deep underground had retained much of their helium4 gave me an idea for a new way to measure the age of zircons -- helium leak dating. The number of lead atoms in a zircon crystal (plus knowing its size relative to the range of alpha particles) tells us how many helium atoms the nuclear decay originally formed in the crystal. The zircons in the report, plus more of the same size that we obtained from the same site, had retained significant fractions (different at each different temperature at the site) of the original helium deposited. Therefore we knew how much helium had leaked from the crystals. We also found about the same amount as had leaked out was still present in the surrounding mineral, biotite. At that time, we did not know the rate at which helium leaks from zircons. If we had known, we could have calculated how long it had been leaking. Roughly speaking, we could divide the amount of helium atoms lost from the zircon by the loss rate to get the age of the zircon. A second hourglass illustrates this method. The golden sand in the top represents helium atoms still in a zircon. The golden sand in the bottom represents the helium that has leaked from the zircon to the biotite. The neck of this second hourglass represents the leak rate of helium from zircon. Then in 2001, we commissioned (through an intermediary who kept us anonymous) one of the world's best experimenters in this field to measure the leak rates of our particular zircons at various temperatures. Not being a creationist, he was not familiar with our prediction. Not being in touch with the experiment, we had no control over its outcome. This was an ideal way to get unbiased data. When we plotted the results, they fell right on the 6000 year prediction! The statistical error bars of both data and prediction meshed neatly, with the central points of each almost overlapping each other. This remarkable line-up of experiment and theory would be unlikely to occur by chance. That gives us confidence that we have understood the helium hourglass correctly. In contrast, the data were more than 100,000 times higher than the 1.5 billion year model, enormously further away than statistical error would allow. Then (essentially) we divided the observed helium losses by the measured leak rates to get a reading from the helium hourglass: 6000 (± 2000) years. The helium leak hourglass says 6000 years. The uranium-lead hourglass says 1.5 billion years. This disagreement is far beyond the statistical error bounds. At least one of the hourglasses must be wrong. Could the helium hourglass be that far wrong? My chapter of the RATE "results" book shows it is very unlikely.6 For example, temperature can change helium diffusion (leak) rates. But to retain the observed amount of helium, these zircons would have had to have been as cold as dry ice (-78°C, -108°F) for most of the alleged eons. Such low temperatures would be impossible at the depth from which our zircons came. For a second example, large changes in the physical laws governing diffusion are also very unlikely, because the same laws also govern biochemistry. It is difficult to imagine such changes not destroying all living things on the earth. On the other hand, changes in the physical laws governing the nucleus of the atom would not greatly affect things outside the nucleus, such as the outer electrons of the atom, chemistry, or life. RATE's hypothesis has been that during several short episodes in Earth history (for example, the Genesis Flood). God changed nuclear forces in order to greatly accelerate nuclear decay, particularly for nuclei that now decay very slowly. I have discussed7 many Scriptures suggesting that God did exactly that. Accelerated nuclear decay would mean that there was a valve on the neck of the uranium-lead hourglass. Most of its sand would fall to the bottom during short episodes when the valve was wide open. Such an acceleration would collapse the billions of years down to the 6000 years of the Bible. Of course, the details are more complex than the above outline for the general public. Technical readers may want to study various technical resources,8-10 where we discuss problems such as excess radiogenic heat. Answers to skeptics are online.11 Many layman's resources12-14 can help you use these results to deflate the myth of billions of years. RATE I: Radioisotopes and the Age of The Earth, L. Vardiman et al., eds. (San Diego, CA: Institute for Creation Research and the Creation Research Society, 2000), 676 pp. RATE II: Radioisotopes and the Age of The Earth: Results of a Young-Earth Creationist Research Initiative, (Volume II), L. Vardiman et al., eds. (San Diego, CA: Institute for Creation Research and the Creation Research Society, 2005), 818 pp. 1. RATE stands for Radioisotopes and the Age of The Earth. See numerous pages at www.icr.org. 2. ICR. 2006. RATE premier conference, 2-disc DVD. 3. Watson, E. B., et al. 1997. The incorporation of Pb into zircon. Chemical Geology 141:19-31. 4. Gentry, R. V., et al. 1982. Differential helium retention in zircons: implications for nuclear waste containment. Geophysical Research Letters. 9 (10):1129-1130. 5. Humphreys, D. R. 2000. Accelerated nuclear decay: a viable hypothesis? RATE I: 348. 6. Humphreys, D. R. 2005. 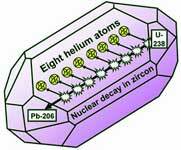 Young helium diffusion age of zircons supports accelerated nuclear decay. RATE II: 58-65, 83-93. 7. Humphreys, D. R. 2000. RATE I: 351-356. 8. Humphreys, D. R. 2005. RATE II: 25-100. 10. Vardiman, L. 2004. RATE posters well received at AGU conference. ICR.org. 11. Humphreys, D. R. 2005. Helium evidence for a young world remains crystal-clear. True Origin.org. See also Humphreys's Helium evidence for a young world overcomes pressure, 2006. True Origin.org. 12. DeYoung, D. 2005. Thousands . . . not billions, Green Forest, AR: Master Books. 13. ICR. 2006. Thousands . . . not billions study guide. El Cajon, CA: ICR. 14. ICR. 2005. Thousands . . . not billions. DVD. El Cajon, CA: ICR. * At the time this article was written, Dr. Humphreys was an Associate Professor of Physics at ICR. Cite this article: Humphreys, D. 2006. A Tale of Two Hourglasses. Acts & Facts. 35 (12).